3 What Devices WIll We Need? Among the myriad wonders and glories unveiled at Google I/O this year, there were a few standouts. One of them is the highly anticipated Google TV. Google has made it abundantly clear: choosing between the TV and the computer is a bad thing. Very bad, indeed. So, we should put them together in an intuitive way that allows us to enjoy the benefits of both without losing the benefits of either one. Great. But what can it do? Well, a lot. A whole lot (see Google’s teaser video here). 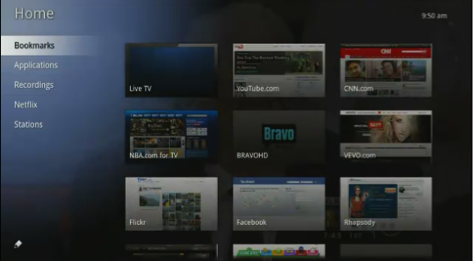 For starters, Google TV wants to make the whole TV experience much more customized to your tastes. Using traditional TV, we have to basically move our schedules around to fit our TV’s schedule. There are number of ways Google will attempt to provide this customizability. First, you can search. How difficult is it to find the correct program on your TV currently? If it’s anything like mine, it takes way too long, and even when you find the right show, you may not have the correct episode. Bringing a keyboard into the living room will provide this ability to easily search for shows and websites right on your TV screen. The first question of many arises: will you mind using a keyboard every time you want to watch a TV show or a football game? Another way Google plans to streamline customization is via existing software - i.e., Android. According to the keynote, Google says that all existing Android apps will be usable on Google TV at launch, with full functionality, without any tinkering (provided, of course, that they don’t require use of the camera or the accelerometer, etc.). Don't interrupt when users are watching TV. Instead, make the viewing experience better. Think about what users will and won't want to do when viewing TV with their family and friends. A few things stand out, one of which is the helpful admonition to “make the viewing experience better.” Google TV is meant to augment our current experience, taking the elements of the web that will provide a richer environment in which to enjoy television. Among those web elements that we are accustomed to that may help enrich our TV experience are the ability to stream music on sites like Pandora or to shop on sites like Gilt or The Gap (to use Google's own examples), for a seamless TV and web experience. Also, how often are you watching a game and want real-time stats? Google showcased an NBA game doing exactly this during yesterday’s keynote. The game was reduced to a small PIP (picture-in-picture) image, and the stats were displayed all over the screen. This begs the question though - is this really better than viewing those same stats on your phone, while the game stays fullscreen? What Devices WIll We Need? 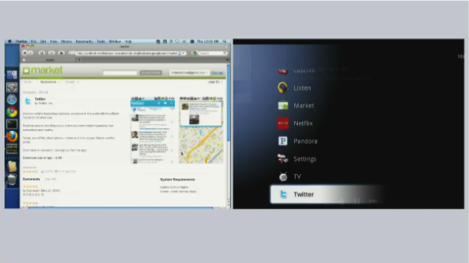 Now, while all of this is impressive, how will we be able to access Google TV? 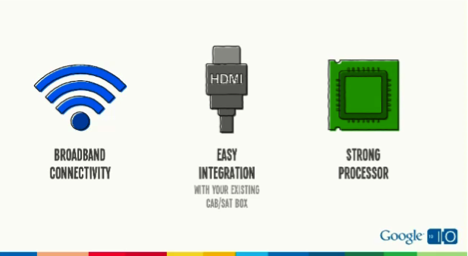 According to the keynote, firstly, and perhaps even most importantly, it will work with your existing cable and satellite boxes. This is huge. And, in terms of other devices, Google has partnered with Sony to create a full line of integrated TVs and Blu-Ray players, while Logitech will make the stand-alone set-top boxes, and Intel will providing the processors that power the devices, which should be available later this year. Google has also hooked up with Dish Network so customers can take advantage of existing technology in order to access Google TV. And, finally, they have teamed up with Best Buy to provide a retail outlet from which to sell these devices. More and more questions pop up like moles in an arcade game. How much will all of these devices cost (or the service itself for that matter!)? And will they be better or worse than devices like Boxee or Roku? These services provide a similar experience, integrating TV and the web. How do we know that Google will be any better at it? Can we use Hulu on Google TV? Will Google be tracking all my activities? How much advertising will be incorporated into the web experience? The answer, sadly, is that we do not have a definitive answer to any of these questions. The bright side, however, is Google plans to keep the platform fairly open. For instance, Google announced that developers can create their own apps that will function as remotes for Google TV, making it possible, vis-a-vis voice recognition, for you to control your TV by simply talking to your phone. Now, that rocks. Another bright spot is Google TV’s support for Flash. Another win for the home team.